Well, we're very sorry to report- the day has finally arrived: Appointments. Please see above picture... this is our current reality! For nearly ten years, we've resisted taking consignments by appointment; we've tried to make consigning as easy and stress-free as possible. Over time we've had to add in some limitations (how many items we accept, how often consignors can bring in new items, how many days/hours we're open to consignments, etc.) in an effort to stem the tide. But we've reached a tipping point, and there doesn't seem to be another reasonable solution; the flow of incoming inventory is just too strong. Every day we're averaging 30-40 consignments, and the numbers are only increasing. With each consignment containing up to 15 adult and/or 25 children's items, it is physically impossible to keep up. It's not simply a matter of manpower. We have fine-tuned our business to maintain our mission – to sell nice, diverse, fashionable clothing to people of all ages and styles at an affordable price – and that would be much harder to sustain if we were to grow in size or staff. As it is, it will take us months to get up to speed on the inventory we currently have (see above picture again!). 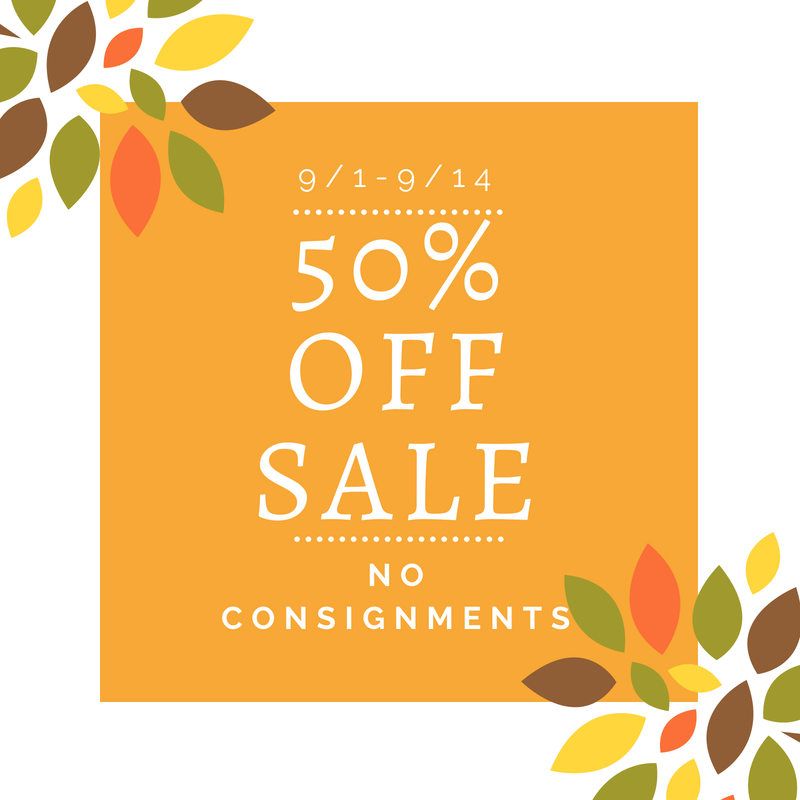 So as of this week, we will no longer be accepting walk-in consignments. Consignors will now need to set up appointments to bring in items. We have enhanced our website to accommodate this-- hopefully it will be easy for everyone to navigate. We still ask that you space out your visits by at least one month, to allow all consignors a chance to come in. There will be one exception to the new appointment policy: if you would like to drop off your consignment without an appointment (though still with at least one month in between, please), we will go through it on our own time and donate what we cannot accept. We have many wonderful charities with whom we work closely to find the extra clothing good homes. If this is what you decide to do, please limit the number of items you bring in to 30. Please note that Mondays and Tuesdays will remain "off" days for all types of consignment, donations included. We do not want to become a donation repository, and if this starts to become the case, we will have to eliminate the drop-off option. Please know that this decision was not made lightly. At this point, it really is our only choice (in case you haven't see above photo yet, take a look now to see what we mean!). We know that this will likely upset and/or turn off certain consignors, but we hope that the majority of you will understand and appreciate our need to make this change. At the end of the day, we are trying to run this business in the best way possible – for us, the consignors and customers, and the community – and the choices we make are based entirely on that objective. If you've made it this far, thank you for reading! Please visit our website for all the details on consigning by appointment. And as always, feel free to come to us with any questions. For the first two weeks of September (9/1 - 9/14) all items older than one month will be 50% OFF! We will not be accepting consignments during the sale. We will resume our regular consigning hours on Saturday, 9/15. No consignments on Mondays and Tuesdays. Please wait one month between consigning visits. We accept up to 15 adult items and/or 25 children's items per visit; you may bring in more, but we cap our intake at 15 and/or 25. Thank you for your patience while we've taken some time to catch up on consignments and revise our policies. As promised, we're sending out an update on our guidelines. We've taken your suggestions into consideration and have tried to make the changes as minimal as possible. Much will remain the same; the main adjustments will be how often consignors can bring in batches and at what times. Aside from that, consigning at Dirt Chic will remain largely the same. We will still be accepting consignments Wednesday through Sunday; however, we are shortening the consigning hours on those days. We will accept consignments starting 1 hour after opening until 1 hour before closing. Please remember we do not accept consignments on Monday or Tuesday. We will need at least one month between consignment visits. Previously we had asked consignors to wait one week between bringing in batches. We've learned that this is not enough time, based on the growing number of consignments we're receiving and the regularity with which many consignors are visiting. We will still accept up to 15 adult items per visit (you may bring in more, but we will cap our intake at 15). However, we will start limiting the number of children's items we accept at one time to 25. If you are bringing in both adult and kids' items, please place them in separate bags. And please pre-sort your items before bringing them in for consignment - we cannot accept items in questionable condition (rips, stains, missing buttons, or other damage). They must be clean, seasonal, and folded neatly in a bag, not on hangers. This helps streamline the intake process. We will also be adding two more half price sales during the year: the first week of June and the first week of December. This will be in addition to the two half price sales in March and September, and we will not be taking consignments during any sales. Please be aware that items older than one month will be 50% off. We understand that this will result in some items generating less profit for consignors (and us), but it will help maintain space on the racks and is in line with our motto of making stylish/good quality clothing accessible and affordable to everyone. We realize we may not be the best fit for all consignors, but this has always been our priority, and find that we form the best relationships with consignors who share the same view. Please consider this when coming in with financial expectations for your items. We are committed to keeping our standards of quality very high, which means we have to be extremely picky about the items we choose to take. We have to make decisions that are good for the business, which benefits all of us in the end. Quality, style, demand, and floor space are among the many things we factor into our decisions. Our goal is to avoid more unscheduled consignment freezes in the future! Thank you again for your flexibility over the last two weeks. We'll resume taking consignments tomorrow at 11AM. Happy spring! We wanted to alert you to some challenges we’re facing at Dirt Chic. Nothing bad— all good problems! But we need to address them before they get worse. We're seeing a significant increase in consignments, and it's reaching an unsustainable level. We want to provide efficient service to consignors and customers; however, we currently receive much more inventory (good inventory!) than we can process or comfortably put out on the floor, and it looks like this trend will only continue. We've always tried to make consigning an easy process, and have resisted requiring appointments, but through the years we've had to put some limitations on how much we take in (15 items at a time, no more than once a week) and when (not Mondays and Tuesdays, and not the first and last half hour of the other days). We’re still falling way behind; we’re currently operating at a 1-2 week deficit, which means that when you bring in a consignment, it can take up to two weeks before we even put your items out for sale. We are in a constant state of catch-up, and that makes it difficult to address other basic needs at the store. Please be aware that we will be making changes to our policies in the coming weeks. We apologize for any inconvenience this may cause; we hope you understand that any changes we make are out of necessity and a desire to make Dirt Chic an even better place to do business. In the meantime, you can help us process incoming consignments faster by pre-sorting your items— making sure clothing is neatly folded in a bag or bin, and doesn’t have any stains, tears, odor, missing buttons, wrinkles, deodorant marks, collar or underarm discoloration, etc. We do not accept items in questionable condition, and would prefer not to spend valuable time sorting through them. Thank you in advance for your help and understanding, and stay tuned for updates! 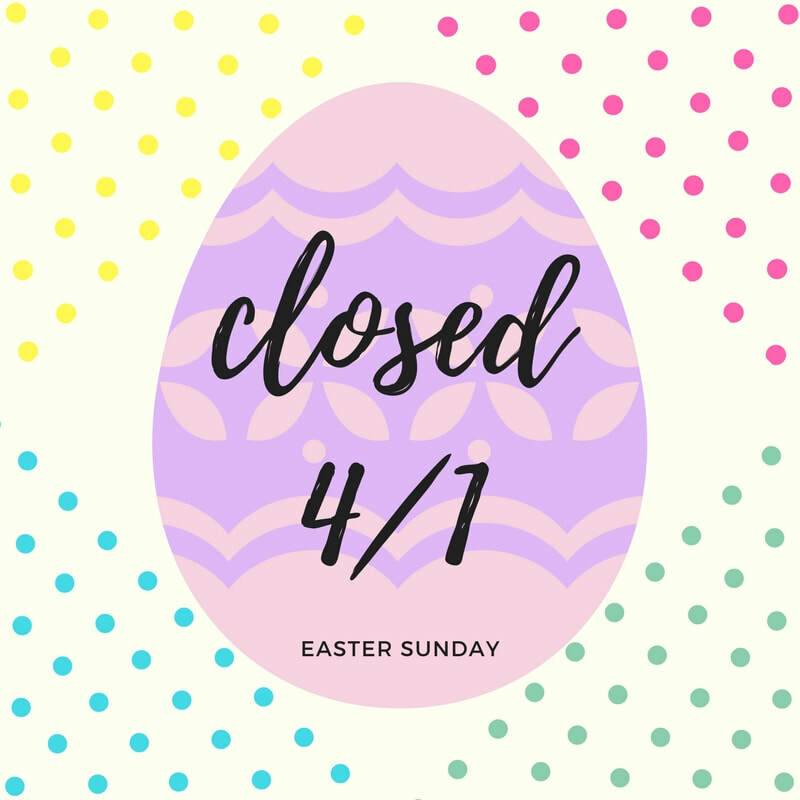 We will be closed on Sunday, 4/1. We will reopen on Monday, 4/2 at 10am. Please remember that we do not accept consignments on Mondays or Tuesdays - consigning hours are: Wednesday - Saturday 10:30-5:30 & Sundays 12:30-4:30. It's that time of year again! Dirt Chic is having its biannual Half Price Sale! We will resume our regular consignment schedule on Thursday, March 15th at 10:30 AM. 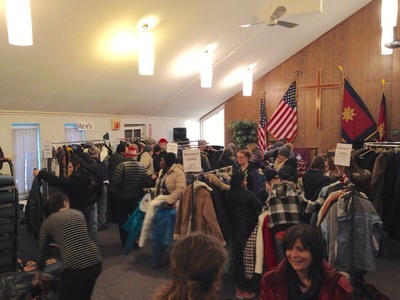 The third annual Coats & Coffee event was a huge success! Thanks to everyone who donated coats and winter accessories, we were able to outfit more than 200 families! We gave away more than 100 coats in the first 30 minutes! Hard at work! 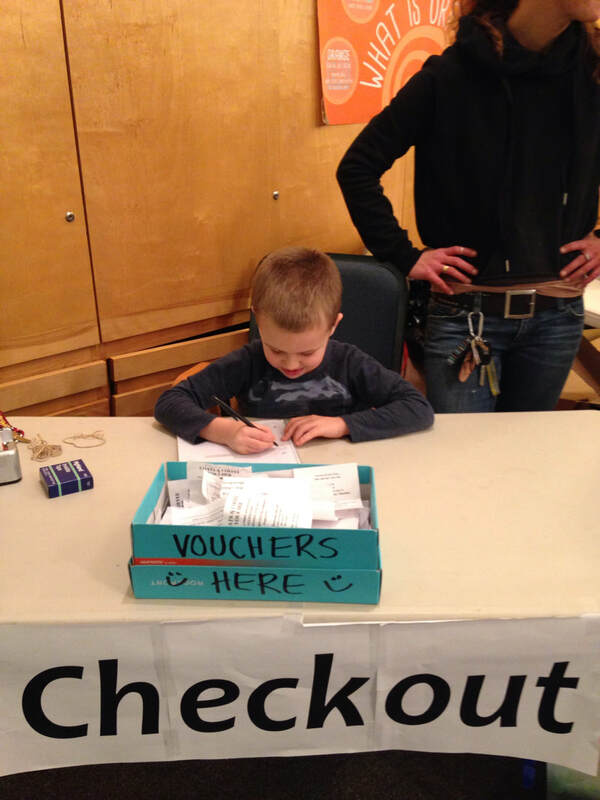 We kept track by collecting vouchers and taking a tally at checkout! 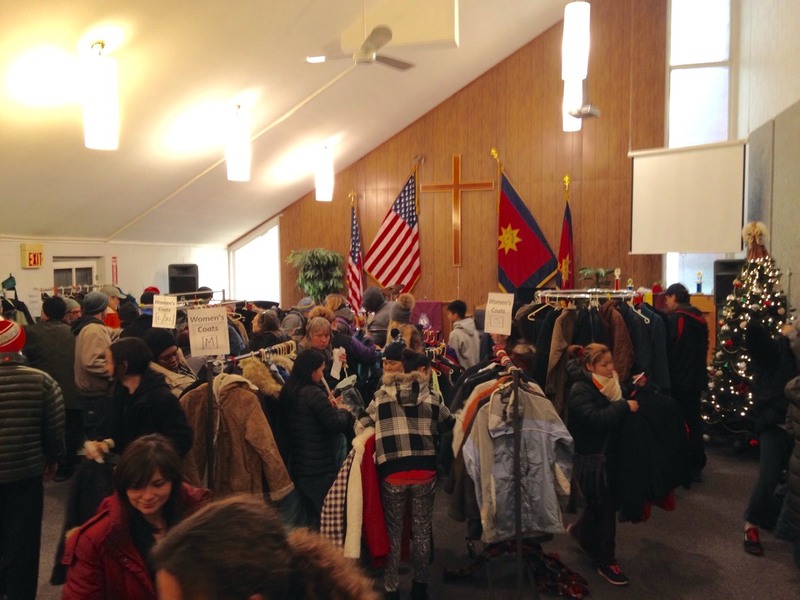 The Salvation Army space was warm and inviting - perfect! Of course, we couldn't have done it without August First Bakery & Cafe! They provided hot coffee and delicious baked goods! 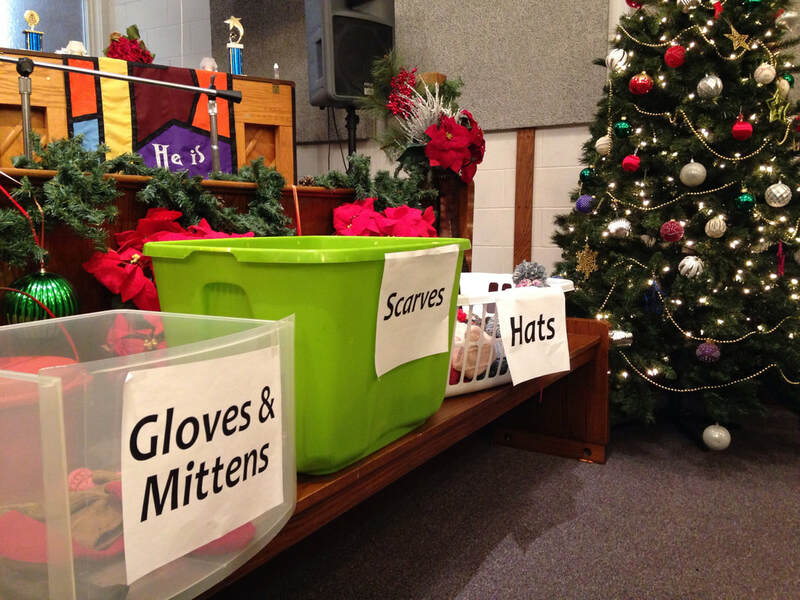 We are so grateful for the generous donations from the community, for the social service organizations who helped us get the word out, and for the Salvation Army for the great space and support! We cant wait for Coats & Coffee 2018! 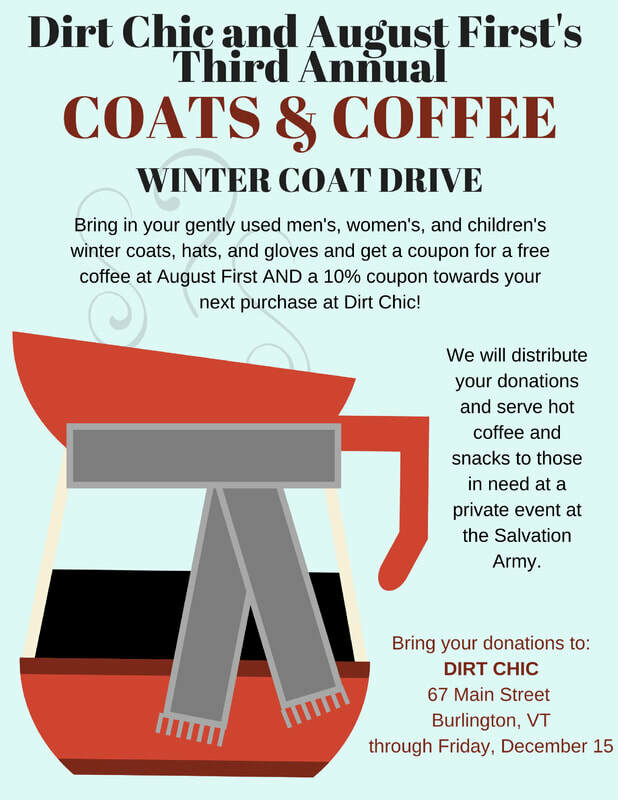 We're holding a coat drive at Dirt Chic in advance of our annual Coats & Coffee event, which we host every year with August First. Coats and Coffee is a free "shopping" opportunity for low income folks around our area; we set up a store-like setting, and those in need can peruse the racks and select winter items for themselves and their families. 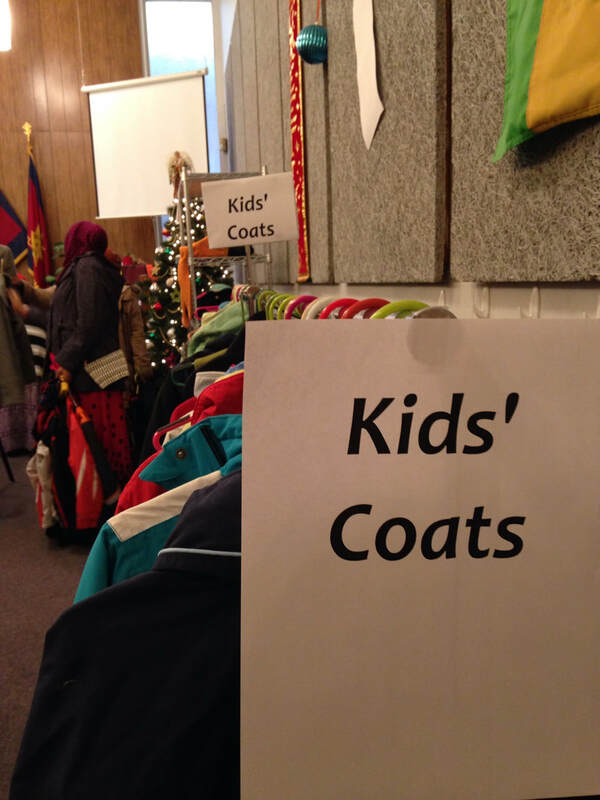 Please feel free to bring in gently-used coats and winter accessories anytime before Saturday, December 16th, and we will be sure to include them in our event. We are giving out Dirt Chic coupons as a show of thanks to those who bring in items for donation. Autumn has been a busy season! We will be taking this time to catch up on all the great inventory we have recently received. We are reaching capacity and physically cannot take in additional inventory until we get through all of the new arrivals and make room for them in the store. We're very sorry for the inconvenience and hope you understand! Since Mondays and Tuesdays are normally non-consignment days, this change will only affect Wednesday, 11/29 through Sunday, 12/3. We will resume our normal consigning hours on Wednesday 12/6.